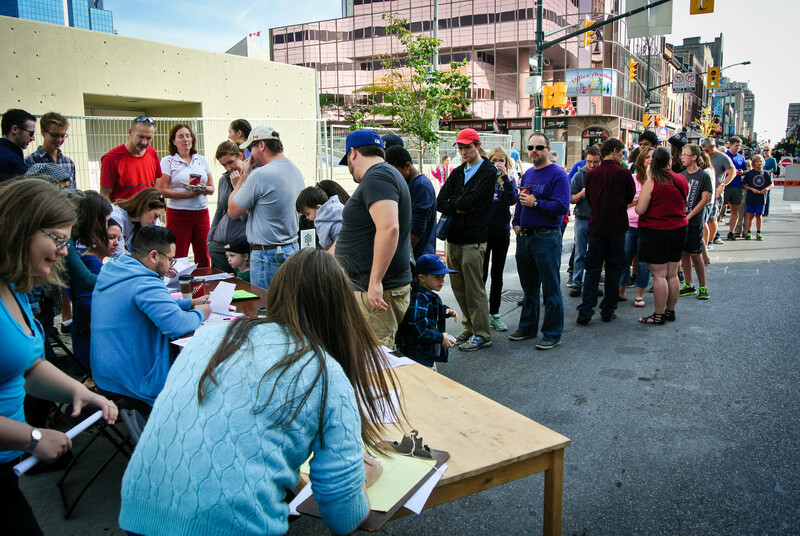 On September 26th, 704 people came together in downtown London to create Canada’s Longest Human Circuit. While we were 611 people short of breaking the World Record for the Longest Human Circuit (currently held in Sydney Australia with 1315 people), we were amazed to see that many people come out in our community to support a fun idea. Now that a couple weeks have gone by, we wanted to write a quick blog post with reflecting on the event and thanking everyone who helped make it possible. We believe in never saying never, but there are no immediate plans for a second World Record attempt. The MakerBus team is incredibly small and organizing an event of this magnitude took the majority of our attention for an entire month. Our first goal is to help people in our community access technology and education, and we’re looking forward to making this our full-time focus for a while. We love the idea of bringing the community together to set a World Record. From the start it was critical that our World Record attempt be open to everyone in our community. While all previous instances of this event were set by schools (since they already have a large community that can be easily organized), we wanted to create a World Record that was open to any single person who believed in big, crazy ideas. Speaking of supporting crazy ideas, we may not have created the World’s Longest Human Circuit, but we did create Canada’s Longest Human Circuit – and this is something to be really proud of. To help thank the 704 people who came out to create Canada’s Longest Human Circuit, we have created an officially unofficial Canadian Record Certificate. 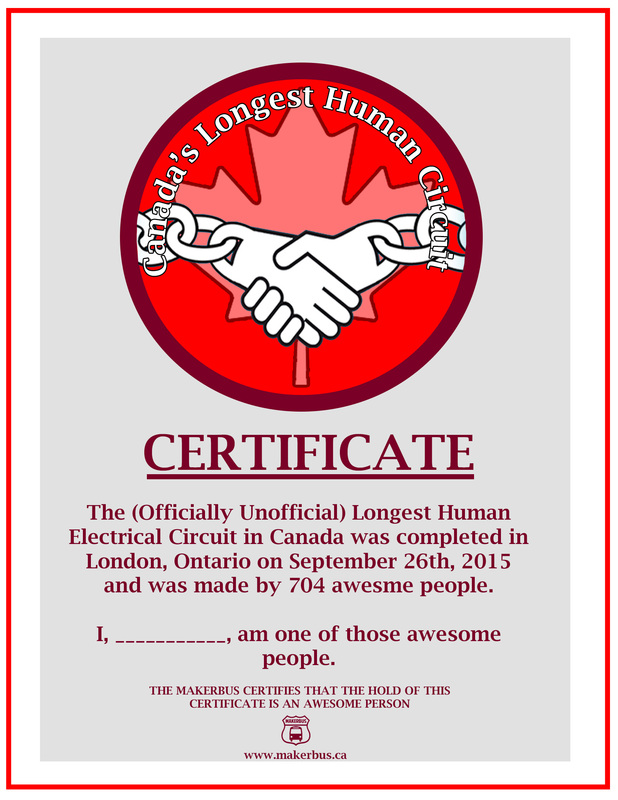 If you want to show your friends how awesome you are, you can print a copy of this certificate and show that you were part of the longest human electrical circuit in Canada (click the picture below to link to a full size version of the certificate). Finally we’d like to thank the people who helped make this event a reality. There are dozens of people (if not hundreds), so if we miss anyone, please know that we are hugely thankful for your contributions. Mayor Matt Brown for being our MC at the event.